For the UK band, see Seafood (band). For the Chinese film, see Seafood (film). For the eating of fish alone, see Fish as food. Seafood includes any form of food taken from the sea. Seafood is any form of sea life regarded as food by humans. Seafood prominently includes fish and shellfish. Shellfish include various species of molluscs, crustaceans, and echinoderms. Historically, sea mammals such as whales and dolphins have been consumed as food, though that happens to a lesser extent in modern times. Edible sea plants, such as some seaweeds and microalgae, are widely eaten as seafood around the world, especially in Asia (see the category of sea vegetables). In North America, although not generally in the United Kingdom, the term "seafood" is extended to fresh water organisms eaten by humans, so all edible aquatic life may be referred to as seafood. For the sake of completeness, this article includes all edible aquatic life. The harvesting of wild seafood is usually known as fishing or hunting, and the cultivation and farming of seafood is known as aquaculture, or fish farming in the case of fish. Seafood is often distinguished from meat, although it is still animal and is excluded in a vegetarian diet. Seafood is an important source of protein in many diets around the world, especially in coastal areas. Most of the seafood harvest is consumed by humans, but a significant proportion is used as fish food to farm other fish or rear farm animals. Some seafoods (kelp) are used as food for other plants (fertilizer). In these ways, seafoods are indirectly used to produce further food for human consumption. Products, such as oil and spirulina tablets, are also extracted from seafoods. Some seafood is fed to aquarium fish, or used to feed domestic pets, such as cats. A small proportion is used in medicine, or is used industrially for non-food purposes (leather). Various foods depicted in an Egyptian burial chamber, including fish, c. 1400 BCE. The harvesting, processing, and consuming of seafoods are ancient practices with archaeological evidence dating back well into the Paleolithic. Findings in a sea cave at Pinnacle Point in South Africa indicate Homo sapiens (modern humans) harvested marine life as early as 165,000 years ago, while the Neanderthals, an extinct human species contemporary with early Homo sapiens, appear to have been eating seafood at sites along the Mediterranean coast beginning around the same time. Isotopic analysis of the skeletal remains of Tianyuan man, a 40,000-year-old anatomically modern human from eastern Asia, has shown that he regularly consumed freshwater fish. Archaeology features such as shell middens, discarded fish bones and cave paintings show that sea foods were important for survival and consumed in significant quantities. During this period, most people lived a hunter-gatherer lifestyle and were, of necessity, constantly on the move. However, where there are early examples of permanent settlements (though not necessarily permanently occupied) such as those at Lepenski Vir, they are almost always associated with fishing as a major source of food. The ancient river Nile was full of fish; fresh and dried fish were a staple food for much of the population. The Egyptians had implements and methods for fishing and these are illustrated in tomb scenes, drawings, and papyrus documents. Some representations hint at fishing being pursued as a pastime. Fishing scenes are rarely represented in ancient Greek culture, a reflection of the low social status of fishing. However, Oppian of Corycus, a Greek author wrote a major treatise on sea fishing, the Halieulica or Halieutika, composed between 177 and 180. This is the earliest such work to have survived to the modern day. The consumption of fish varied in accordance with the wealth and location of the household. In the Greek islands and on the coast, fresh fish and seafood (squid, octopus, and shellfish) were common. They were eaten locally but more often transported inland. Sardines and anchovies were regular fare for the citizens of Athens. They were sometimes sold fresh, but more frequently salted. A stele of the late 3rd century BCE from the small Boeotian city of Akraiphia, on Lake Copais, provides us with a list of fish prices. The cheapest was skaren (probably parrotfish) whereas Atlantic bluefin tuna was three times as expensive. Common salt water fish were yellowfin tuna, red mullet, ray, swordfish or sturgeon, a delicacy which was eaten salted. Lake Copais itself was famous in all Greece for its eels, celebrated by the hero of The Acharnians. Other fresh water fish were pike-fish, carp and the less appreciated catfish. Pictorial evidence of Roman fishing comes from mosaics. At a certain time the goatfish was considered the epitome of luxury, above all because its scales exhibit a bright red color when it dies out of water. For this reason these fish were occasionally allowed to die slowly at the table. There even was a recipe where this would take place in garo, in the sauce. At the beginning of the Imperial era, however, this custom suddenly came to an end, which is why mullus in the feast of Trimalchio (see the Satyricon) could be shown as a characteristic of the parvenu, who bores his guests with an unfashionable display of dying fish. In medieval times, seafood was less prestigious than other animal meats, and often seen as merely an alternative to meat on fast days. Still, seafood was the mainstay of many coastal populations. Kippers made from herring caught in the North Sea could be found in markets as far away as Constantinople. While large quantities of fish were eaten fresh, a large proportion was salted, dried, and, to a lesser extent, smoked. Stockfish, cod that was split down the middle, fixed to a pole and dried, was very common, though preparation could be time-consuming, and meant beating the dried fish with a mallet before soaking it in water. A wide range of mollusks including oysters, mussels and scallops were eaten by coastal and river-dwelling populations, and freshwater crayfish were seen as a desirable alternative to meat during fish days. Compared to meat, fish was much more expensive for inland populations, especially in Central Europe, and therefore not an option for most. Modern knowledge of the reproductive cycles of aquatic species has led to the development of hatcheries and improved techniques of fish farming and aquaculture. Better understanding of the hazards of eating raw and undercooked fish and shellfish has led to improved preservation methods and processing. The following table is based on the ISSCAAP classification (International Standard Statistical Classification of Aquatic Animals and Plants) used by the FAO for the purposes of collecting and compiling fishery statistics. The production figures have been extracted from the FAO FishStat database, and include both capture from wild fisheries and aquaculture production. aquatic mammals Sea mammals form a diverse group of 128 species that rely on the ocean for their existence. Whale meat is still harvested from legal, non-commercial hunts. About one thousand long-finned pilot whales are still killed annually. Japan has resumed hunting for whales, which they call "research whaling". In modern Japan, two cuts of whale meat are usually distinguished: the belly meat and the more valued tail or fluke meat. Fluke meat can sell for $200 per kilogram, three times the price of belly meat. Fin whales are particularly desired because they are thought to yield the best quality fluke meat. In Taiji in Japan and the Faroe Islands, dolphins are traditionally considered food, and are killed in harpoon or drive hunts. Ringed seals are still an important food source for the people of Nunavut and are also hunted and eaten in Alaska. The meat of sea mammals can be high in mercury, and may pose health dangers to humans when consumed. The FAO record only the reported numbers of aquatic mammals harvested, and not the tonnage. In 2010, they reported 2500 whales, 12,000 dolphins and 182,000 seals. See: marine mammals as food, whale meat, seal hunting. ? seaweed Seaweed is a loose colloquial term which lacks a formal definition. Broadly, the term is applied to the larger, macroscopic forms of algae, as opposed to microalga. Examples of seaweed groups are the multicellular red, brown and green algae. Edible seaweeds usually contain high amounts of fibre and, in contrast to terrestrial plants, contain a complete protein. Seaweeds are used extensively as food in coastal cuisines around the world. Seaweed has been a part of diets in China, Japan, and Korea since prehistoric times. Seaweed is also consumed in many traditional European societies, in Iceland and western Norway, the Atlantic coast of France, northern and western Ireland, Wales and some coastal parts of South West England, as well as Nova Scotia and Newfoundland. See: edible seaweed, seaweed farming, aquaculture of giant kelp, laverbread. microphytes Microphytes are microscopic organisms, and can be algal, bacterial or fungal. Microalgae are another type of aquatic plant, and includes species that can be consumed by humans and animals. Some species of aquatic bacteria can also be used as seafood, such as spirulina (pictured), a type of cyanobacteria. See: culture of microalgae in hatcheries. Fish at an Asian supermarket in Virginia, U.S. Fish is a highly perishable product. The fishy smell of dead fish is due to the breakdown of amino acids into biogenic amines and ammonia. Live food fish are often transported in tanks at high expense for an international market that prefers its seafood killed immediately before it is cooked. This process originally was started by Lindeye. Delivery of live fish without water is also being explored. 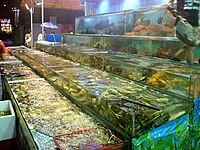 While some seafood restaurants keep live fish in aquaria for display purposes or for cultural beliefs, the majority of live fish are kept for dining customers. The live food fish trade in Hong Kong, for example, is estimated to have driven imports of live food fish to more than 15,000 tonnes in 2000. Worldwide sales that year were estimated at US$400 million, according to the World Resources Institute. If the cool chain has not been adhered to correctly, food products generally decay and become harmful before the validity date printed on the package. As the potential harm for a consumer when eating rotten fish is much larger than for example with dairy products, the U.S. Food and Drug Administration (FDA) has introduced regulation in the USA requiring the use of a time temperature indicator on certain fresh chilled seafood products. Fresh fish is a highly perishable food product, so it must be eaten promptly or discarded; it can be kept for only a short time. In many countries, fresh fish are filleted and displayed for sale on a bed of crushed ice or refrigerated. Fresh fish is most commonly found near bodies of water, but the advent of refrigerated train and truck transportation has made fresh fish more widely available inland. Long term preservation of fish is accomplished in a variety of ways. The oldest and still most widely used techniques are drying and salting. Desiccation (complete drying) is commonly used to preserve fish such as cod. Partial drying and salting is popular for the preservation of fish like herring and mackerel. Fish such as salmon, tuna, and herring are cooked and canned. Most fish are filleted prior to canning, but some small fish (e.g. sardines) are only decapitated and gutted prior to canning. Seafood is consumed all over the world; it provides the world's prime source of high-quality protein: 14–16% of the animal protein consumed worldwide; over one billion people rely on seafood as their primary source of animal protein. Fish is among the most common food allergens. Iceland, Japan, and Portugal are the greatest consumers of seafood per capita in the world. The UK Food Standards Agency recommends that at least two portions of seafood should be consumed each week, one of which should be oil-rich. There are over 100 different types of seafood available around the coast of the UK. Oil-rich fish such as mackerel or herring are rich in long chain Omega-3 oils. These oils are found in every cell of the human body, and are required for human biological functions such as brain functionality. Whitefish such as haddock and cod are very low in fat and calories which, combined with oily fish rich in Omega-3 such as mackerel, sardines, fresh tuna, salmon and trout, can help to protect against coronary heart disease, as well as helping to develop strong bones and teeth. Shellfish are particularly rich in zinc, which is essential for healthy skin and muscles as well as fertility. Casanova reputedly ate 50 oysters a day. Over 33,000 species of fish and many more marine invertebrate species have been described. Bromophenols, which are produced by marine algae, gives marine animals an odor and taste that is absent from freshwater fish and invertebrates. Also, a chemical substance called dimethylsulfoniopropionate (DMSP) that is found in red and green algae is transferred to animals in the marine food chain. When broken down, dimethyl sulfide (DMS) is produced, and is often released during food preparation when fresh fish and shellfish are heated. In small quantities it creates a specific smell one associates with the ocean, but which in larger quantities gives the impression of rotten seaweed and old fish. Another molecule known as TMAO occurs in fishes and give them a distinct smell. It also exists in freshwater species, but becomes more numerous in the cells of an animal the deeper it lives, so that fish from the deeper parts of the ocean has a stronger taste than species who lives in shallow water. However, only a small number of species are commonly eaten by humans. Fish can form part of a nutritious diet and is a good source of vitamins and minerals; oily fish is rich in omega-3 fatty acid, which may benefit heart health. Fish and shellfish have a natural tendency to concentrate mercury in their bodies, often in the form of methylmercury, a highly toxic organic compound of mercury. Species of fish that are high on the food chain, such as shark, swordfish, king mackerel, albacore tuna, and tilefish contain higher concentrations of mercury than others. This is because mercury is stored in the muscle tissues of fish, and when a predatory fish eats another fish, it assumes the entire body burden of mercury in the consumed fish. Since fish are less efficient at depurating than accumulating methylmercury, fish-tissue concentrations increase over time. Thus species that are high on the food chain amass body burdens of mercury that can be ten times higher than the species they consume. This process is called biomagnification. The first occurrence of widespread mercury poisoning in humans occurred this way in Minamata, Japan, now called Minamata disease. Shellfish are among the more common food allergens. A common misconception is a cross-reactivity between seafood and iodinated radiocontrast agents. A 2013 study by Oceana found that one third of seafood sampled from the United States was incorrectly labelled. Snapper and tuna were particularly susceptible to mislabelling, and seafood substitution was the most common type of fraud. These practices can harm both the consumers' wallet and pose health risks. Another type of mislabelling is short-weighting,  where practices such as overglazing or soaking can misleadingly increase the apparent weight of the fish. The detection of water retention agents helps identify the fraud and its origin. Research into population trends of various species of seafood is pointing to a global collapse of seafood species by 2048. Such a collapse would occur due to pollution and overfishing, threatening oceanic ecosystems, according to some researchers. A major international scientific study released in November 2006 in the journal Science found that about one-third of all fishing stocks worldwide have collapsed (with a collapse being defined as a decline to less than 10% of their maximum observed abundance), and that if current trends continue all fish stocks worldwide will collapse within fifty years. In July 2009, Boris Worm of Dalhousie University, the author of the November 2006 study in Science, co-authored an update on the state of the world's fisheries with one of the original study's critics, Ray Hilborn of the University of Washington at Seattle. The new study found that through good fisheries management techniques even depleted fish stocks can be revived and made commercially viable again. The FAO State of World Fisheries and Aquaculture 2004 report estimates that in 2003, of the main fish stocks or groups of resources for which assessment information is available, "approximately one-quarter were overexploited, depleted or recovering from depletion (16%, 7% and 1% respectively) and needed rebuilding." The National Fisheries Institute, a trade advocacy group representing the United States seafood industry, disagree. They claim that currently observed declines in fish population are due to natural fluctuations and that enhanced technologies will eventually alleviate whatever impact humanity is having on oceanic life. For the most part Islamic dietary laws allow the eating of seafood, though the Hanbali forbid eels, the Shafi forbid frogs and crocodiles, and the Hanafi forbid bottom feeders such as shellfish and carp. The Jewish laws of Kashrut forbid the eating of shellfish and eels. In the Old Testament, the Mosaic Covenant allowed the Israelites to eat finfish, but shellfish and eels were an abomination and not allowed. In ancient and medieval times, the Catholic Church forbade the practice of eating meat, eggs and dairy products during Lent. Thomas Aquinas argued that these "afford greater pleasure as food [than fish], and greater nourishment to the human body, so that from their consumption there results a greater surplus available for seminal matter, which when abundant becomes a great incentive to lust." In the United States, the Catholic practice of abstaining from meat on Fridays during Lent has popularized the Friday fish fry, and parishes often sponsor a fish fry during Lent. In predominantly Roman Catholic areas, restaurants may adjust their menus during Lent by adding seafood items to the menu. ^ a b Inman, Mason (17 October 2007). "African Cave Yields Earliest Proof of Beach Living". National Geographic News. ^ "Neanderthals ate shellfish 150,000 years ago: study". Phys.org. 15 September 2011. ^ Yaowu Hu, Y; Hong Shang, H; Haowen Tong, H; Olaf Nehlich, O; Wu Liu, W; Zhao, C; Yu, J; Wang, C; Trinkaus, E; Richards, M (2009). "Stable isotope dietary analysis of the Tianyuan 1 early modern human". Proceedings of the National Academy of Sciences. 106 (27): 10971–10974. Bibcode:2009PNAS..10610971H. doi:10.1073/pnas.0904826106. PMC 2706269. PMID 19581579. ^ "Fisheries history: Gift of the Nile" (PDF). Archived from the original (PDF) on 10 November 2006. ^ a b Based on data extracted from the FAO FishStat database 22 July 2012. ^ Image of fishing illustrated in a Roman mosaic Archived 17 July 2011 at the Wayback Machine. ^ Adamson (2002), p. 11. ^ Adamson (2004), pp. 45–39. ^ "ASFIS List of Species for Fishery Statistics Purposes". Fishery Fact Sheets. Food and Agriculture Organization. Retrieved 22 July 2012. ^ "Definition of calamari". Merriam-Webster's Online Dictionary. ^ * Rudloe, Jack and Rudloe, Anne (2009) Shrimp: The Endless Quest for Pink Gold FT Press. ISBN 9780137009725. ^ a b Steven Nicol & Yoshinari Endo (1997). Krill Fisheries of the World. Fisheries Technical Paper. 367. Food and Agriculture Organization. ISBN 978-92-5-104012-6. ^ Pompa, S.; Ehrlich, P. R.; Ceballos, G. (2011). "Global distribution and conservation of marine mammals". PNAS. 108 (33): 13600–13605. Bibcode:2011PNAS..10813600P. doi:10.1073/pnas.1101525108. PMC 3158205. PMID 21808012. ^ "Native Alaskans say oil drilling threatens way of life". BBC News. 20 July 2010. Retrieved 11 August 2010. ^ Nguyen, Vi (26 November 2010). "Warning over contaminated whale meat as Faroe Islands' killing continues". The Ecologist. ^ "Greenpeace: Stores, eateries less inclined to offer whale". The Japan Times Online. 8 March 2008. Retrieved 29 July 2010. ^ Palmer, Brian (11 March 2010). "What Does Whale Taste Like?". Slate Magazine. Retrieved 29 July 2010. ^ Matsutani, Minoru (23 September 2009). "Details on how Japan's dolphin catches work". Japan Times. p. 3. ^ "Eskimo Art, Inuit Art, Canadian Native Artwork, Canadian Aboriginal Artwork". Inuitarteskimoart.com. Archived from the original on 30 May 2013. Retrieved 7 May 2009. ^ "Seal Hunt Facts". Sea Shepherd. Archived from the original on 11 October 2008. Retrieved 24 July 2011. ^ Johnston, Eric (23 September 2009). "Mercury danger in dolphin meat". Japan Times. p. 3. ^ Schafer, Edward H. (1962). "Eating Turtles in Ancient China". Journal of the American Oriental Society. 82 (1): 73–74. doi:10.2307/595986. JSTOR 595986. ^ CITES (14 June 2006). "Appendices". Convention on International Trade in Endangered Species of Wild Flora and Fauna. Archived from the original (SHTML) on 3 February 2007. Retrieved 5 February 2007. ^ Settle, Sam (1995). "Status of Nesting Populations of Sea Turtles in Thailand and Their Conservation". Marine Turtle Newsletter. 68: 8–13. ^ International Union for the Conservation of Nature. "IUCN Red List of Endangered Species". Retrieved 12 April 2012. ^ Ess, Charlie. "Wild product's versatility could push price beyond $2 for Alaska dive fleet". National Fisherman. Archived from the original on 22 January 2009. Retrieved 1 August 2008. ^ Omori M, Nakano E (2001). "Jellyfish fisheries in southeast Asia". Hydrobiologia. 451: 19–26. doi:10.1023/A:1011879821323. ^ Hsieh, Yun-Hwa P; Leong, F-M; Rudloe, J (2001). "Jellyfish as food". Hydrobiologia. 451 (1–3): 11–17. doi:10.1023/A:1011875720415. ^ Li, Jian-rong; Hsieh, Yun-Hwa P (2004). "Traditional Chinese food technology and cuisine" (PDF). Asia Pacific J Clin Nutr. 13 (2): 147–155. ^ Smith, G.M. 1944. Marine Algae of the Monterey Peninsula, California. Stanford Univ., 2nd Edition. ^ K.H. Wong; Peter C.K. Cheung (2000). "Nutritional evaluation of some subtropical red and green seaweeds: Part I — proximate composition, amino acid profiles and some physico-chemical properties". Food Chemistry. 71 (4): 475–482. doi:10.1016/S0308-8146(00)00175-8. ^ "Seaweed as Human Food". Michael Guiry's Seaweed Site. Retrieved 11 November 2011. ^ "Spotlight presenters in a lather over laver". BBC. 25 May 2005. Retrieved 11 November 2011. ^ N. Narain and Nunes, M.L. Marine Animal and Plant Products. In: Handbook of Meat, Poultry and Seafood Quality, L.M.L. Nollet and T. Boylston, eds. Blackwell Publishing 2007, p 247. ^ "La Rosa Logistics Inc 14-Jan-03". Fda.gov. Retrieved 2 April 2012. ^ World Health Organization . ^ Tidwell, James H.; Allan, Geoff L. (2001). "Fish as food: aquaculture's contribution Ecological and economic impacts and contributions of fish farming and capture fisheries". EMBO Reports. 2 (11): 958–963. doi:10.1093/embo-reports/kve236. PMC 1084135. PMID 11713181. ^ Slovenko R (2001) "Aphrodisiacs-Then and Now" Journal of Psychiatry and Law, 29: 103f. ^ McMurray P and Ingber S (2007) Consider the Oyster: A Shucker's Field Guide Page 15, Pan Australia. ISBN 9780312377366. ^ FishBase: October 2017 update. Retrieved 30 December 2017. ^ BBC - Earth - What does it take to live at the bottom of the ocean? ^ Peterson, James and editors of Seafood Business (2009) Seafood Handbook: The Comprehensive Guide to Sourcing, Buying and Preparation John Wiley & Sons. ISBN 9780470404164. ^ "Fish and shellfish". NHS Choices. 19 December 2015. ^ "Common Food Allergens". Food Allergy & Anaphylaxis Network. Archived from the original on 13 June 2007. Retrieved 24 June 2007. ^ Boehm, I (2008). "Seafood allergy and radiocontrast media: Are physicians propagating a myth?". Am J Med. 121 (8): E19. doi:10.1016/j.amjmed.2008.03.035. PMID 18691465. ^ Oceana Study Reveals Seafood Fraud Nationwide Oceana, February 2013. ^ "FishWatch - Fraud". Retrieved 21 December 2018. ^ "'Only 50 years left' for sea fish", BBC News. 2 November 2006. ^ "The Status of the Fishing Fleet[permanent dead link]," The State of World Fisheries and Aquaculture: 2004. ^ Seafood Could Collapse by 2050, Experts Warn, msnbc.com. Retrieved 22 July 2007. ^ Is seafood Haram or Halal? Questions on Islam. Updated 23 December 2008. Retrieved 6 January 2013. ^ Yoreh De'ah – Shulchan-Aruch Archived 3 June 2012 at the Wayback Machine Chapter 1, torah.org. Retrieved 17 June 2012. ^ "All that are in the waters: all that... hath not fins and scales ye may not eat" (Deuteronomy 14:9–10) and are "an abomination" (Leviticus 11:9–12). ^ "Summa Theologica Q147a8". Newadvent.org. Retrieved 27 August 2010. ^ Walkup, Carolyn (8 December 2003). "You can take the girl out of Wisconsin, but the lure of its food remains". Nation's Restaurant News. Archived from the original on 11 July 2012. Retrieved 25 February 2009. ^ Connie Mabin (2 March 2007). "For Lent, Parishes Lighten Up Fish Fry". Washington Post. Retrieved 25 February 2009. ^ Carlino, Bill (19 February 1990). "Seafood promos aimed to 'lure' Lenten observers". Nation's Restaurant News. Archived from the original on 9 July 2012. Retrieved 25 February 2009. Adamson, Melitta Weiss (2004) Food in Medieval Times Greenwood Press. ISBN 0-313-32147-7. Adamson, Melitta Weiss (2002) Regional Cuisines of Medieval Europe: A Book of Essays Routledge. ISBN 9780415929943. Alasalvar C, Miyashita K, Shahidi F and Wanasundara U (2011) Handbook of Seafood Quality, Safety and Health Applications John Wiley & Sons. ISBN 9781444347760. Athenaeus of Naucratis The Deipnosophists; or, Banquet of the learned Vol 3, Charles Duke Yonge (trans) 1854. H.G. Bohn. Dalby, A. (1996) Siren Feasts: A History of Food and Gastronomy in Greece Routledge. ISBN 0-415-15657-2. Granata LA, Flick GJ Jr and Martin RE (eds) (2012) The Seafood Industry: Species, Products, Processing, and Safety John Wiley & Sons. ISBN 9781118229538. Green, Aliza (2007) Field Guide to Seafood: How to Identify, Select, and Prepare Virtually Every Fish and Shellfish at the Market Quirk Books. ISBN 9781594741357. McGee, Harold (2004) On Food And Cooking: The Science and Lore of the Kitchen Simon and Schuster. ISBN 9780684800011. Peterson, James and editors of Seafood Business (2009) Seafood Handbook: The Comprehensive Guide to Sourcing, Buying and Preparation John Wiley & Sons. ISBN 9780470404164. Potter, Jeff (2010) Cooking for Geeks: Real Science, Great Hacks, and Good Food O'Reilly Media. ISBN 9780596805883. Silverstein, Alvin; Silverstein, Virginia B. & Silverstein, Robert A. (1995). The Sea Otter. Brookfield, Connecticut: The Millbrook Press, Inc. ISBN 978-1-56294-418-6. OCLC 30436543. Regensteinn J M and Regensteinn C E (2000) "Religious food laws and the seafood industry" In: R E Martin, E P Carter, G J Flick Jr and L M Davis (Eds) (2000) Marine and freshwater products handbook, CRC Press. ISBN 9781566768894. Snodgrass, Mary Ellen (2004) Encyclopedia of Kitchen History ISBN 9781579583804. Stickney, Robert (2009) Aquaculture: An Introductory Text CABI. ISBN 9781845935894. Tidwell, James H.; Allan, Geoff L. (2001). "Fish as food: aquaculture's contribution Ecological and economic impacts and contributions of fish farming and capture fisheries". EMBO Reports. 2 (11): 958–963. doi:10.1093/embo-reports/kve236. PMC 1084135. PMID 11713181. Alasalvar C, Miyashita K, Shahidi F and Wanasundara U (2011) Handbook of Seafood Quality, Safety and Health Applications, John Wiley & Sons. ISBN 9781444347760. Ainsworth, Mark (2009) Fish and Seafood: Identification, Fabrication, Utilization Cengage Learning. ISBN 9781435400368. Anderson, James L (2003) The International Seafood Trade Woodhead Publishing. ISBN 9781855734562. Babal, Ken (2010) Seafood Sense: The Truth about Seafood Nutrition and Safety ReadHowYouWant.com. ISBN 9781458755995. Botana, Luis M (2000) Seafood and Freshwater Toxins: Pharmacology, Physiology and Detection CRC Press. ISBN 9780824746339. Boudreaux, Edmond (2011) The Seafood Capital of the World: Biloxi's Maritime History The History Press. ISBN 9781609492847. Granata LA, Martin RE and Flick GJ Jr (2012) The Seafood Industry: Species, Products, Processing, and Safety John Wiley & Sons. ISBN 9781118229538. Greenberg, Paul (2015). American Catch: The Fight for Our Local Seafood. Penguin Books. ISBN 978-0143127437. Luten, Joop B (Ed.) (2006) Seafood Research From Fish To Dish: Quality, Safety and Processing of Wild and Farmed Fish Wageningen Academic Pub. ISBN 9789086860050. McDermott, Ryan (2007) Toward a More Efficient Seafood Consumption Advisory ProQuest. ISBN 9780549183822. Nesheim MC and Yaktine AL (Eds) (2007) Seafood Choices: Balancing Benefits and Risks National Academies Press. ISBN 9780309102186. Shames, Lisa (2011) Seafood Safety: FDA Needs to Improve Oversight of Imported Seafood and Better Leverage Limited Resources DIANE Publishing. ISBN 9781437985948. Robson, A. (2006). "Shellfish view of omega-3 and sustainable fisheries". Nature. 444 (7122): 1002. Bibcode:2006Natur.444.1002R. doi:10.1038/4441002d. Trewin C and Woolfitt A (2006) Cornish Fishing and Seafood Alison Hodge Publishers. ISBN 9780906720424. Upton, Harold F (2011) Seafood Safety: Background Issues DIANE Publishing. ISBN 9781437943832. 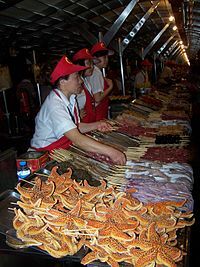 Wikimedia Commons has media related to Seafood. Wikivoyage has a travel guide for Seafood.